DREAM IT. PLAN IT. FLY IT. We are a group of entrepreneurs living in Mallorca. 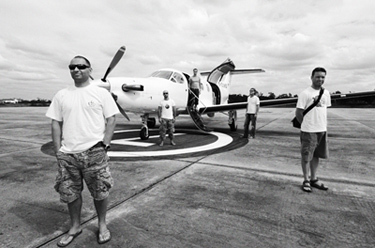 One day we decided to take a single engine Pilatus PC-12 and travel around the world. We started the planning and “The Smiling Flyer” was born. We will take off from Mallorca in Spain on November 3rd 2007 and visiting the following places: Crete, Egypt, Dubai/United Arab Emirates, Maldives, India, Thailand, Indonesia, Papua New Guinea, Australia, North Fork Island, Tonga, Cook Islands, French Polynesia, , Chile , Uruguay, Brazil , Fernando de Noronha Island, Cape Verde, Morocco and Spain. Keep up to date on our travels by reading this Blog.